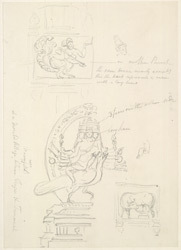 Pencil drawing by Thomas Daniell of an image of Subrahmanya on his peacock with other sculptured details, dated 1792. Inscribed on front in pencil: 'At a deserted vilage (Manarrooapittah) between Teugar and Trinomal. ', with other notes. Subramanya or Skanda is the Hindu god of war. He is the son of Shiva and Shakti and the brother of Ganapati or Ganesh. His cult has remained confined to South India where he is known as Murugan in Tamil Nadu. He is said to have been reared by the six divine mothers of the constellation Krittika, hence his name Kartikkeya. He is represented with six heads that he assumed to suckle the milk from the six mothers. He was appointed the commander-in chief of the gods, Devasenapati. He is very young and virile and a forceful attacker in the war and has cumulated the power of chastity. The peacock is his mount.